Going, Going, Gone In The Thumb? In 1987, I was hired by the Wildlife Division of the Michigan Department of Natural Resources to write summaries of two rare dune plants of the Great Lakes shoreline, Houghton's Goldenrod and Pitcher's Thistle. In researching Pitcher's Thistle, a Michigan and federally Threatened species, I found that there was a small population recorded for Port Crescent State Park in Huron County, which had not been seen for decades according to the references available to me. 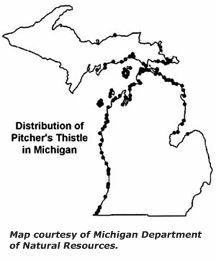 This was the southern-most location for Pitcher's Thistle recorded along Lake Huron. I grew up in Boy Scout Troop 169 near Port Huron, and one of our favorite summer campouts was in the wooded dunes of Port Crescent State Park, where the Pinnebog River empties into Lake Huron. Al Eicher's The Way it Was ... Scouting Around the Thumb article in The Lakeshore Guardian last month brings back fond memories of our times up there. Later, as an Assistant Scoutmaster for Troop 169, we continued our annual July campouts at Port Crescent, and I explored the dunes for the supposedly lost colony of Pitcher's Thistle. I was disappointed in 1989, having thoroughly searched the open foredunes (above the beach) east of the Pinnebog River, where wind still shifts the sand amongst the Beach Grass - Ammophila breviligulata and other dune plants. The next July, a few scouts and I were portaging a canoe from an oxbow of the Pinnebog over a sand ridge and down to the mouth of the river to avoid having to bushwhack our way out to Lake Huron. As with other significant botanical finds presented to me in less than standard fashion, while heeding the call of nature or gracefully tripping over a log, I stumbled as we pulled the canoe over the ridge, probably with the idea of riding it down the other side, and there a few feet away was a large, multi-branched flowering Pitcher's Thistle. This plant was right at the rim of an old sand pit, at the edge of grape vines, Poison Ivy, and a few small oaks. 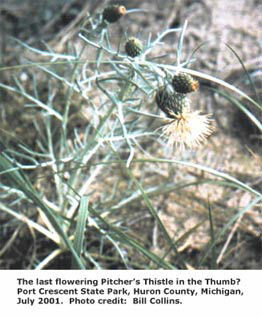 The spot had not been mined for decades, but the disturbance must have been just right to allow the Pitcher's Thistle to establish and thrive. I found about 15 more plants in the area, with only a few in-flower. It was apparent that this little colony was probably too small to reproduce itself much longer. My wife and I continued to monitor the plants up through 2002, and sure enough, it appears that they no longer exist, having dwindled to just one plant the last time we found any. Pitcher's Thistle - Cirsium pitcheri, is named for Dr. Zina Pitcher, who found it along Lake Superior when stationed in Sault Sainte Marie as an Army surgeon from 1826-28. Many of the medical doctors at that time were also botanists to some degree because of their reliance on medicinal plants. The plant was also found along Lake Huron by Edwin James, another Army surgeon, probably near Mackinac Island where he was stationed in 1827. Pitcher's Thistle grows only along the Great Lakes shoreline. It is thought to be closely related to a western species, Cirsium canescens, and probably migrated slowly to the Great Lakes from the Great Plains as the last glaciers retreated, colonizing temporary dunes left in their wake. Unlike other thistles, Pitcher's Thistle lacks the many sharp spines, except a small one at the tip of each leaf and the flower head bracts, and the plant is bluish-green under a dense covering of white hairs, giving it a gray, woolly appearance. The hairs reduce the intense sun and wind exposure of the dunes. The leaves are very branched and narrow, often less than a ¼ inch wide, an adaptation that decreases leaf desiccation by minimizing the surface area. The plant develops a long taproot, up to about 6 feet, which accesses a relatively constant supply of soil moisture below the dunes. The plant can take about 5 to 8 years to mature before it flowers. Prior to flowering, it exists as a "rosette", a whirl of stemless leaves that emerge from the ground similar to a Dandelion. Most of the leaves are elevated, giving the small plant a cone-shape from a side view. During this rosette stage, Pitcher's Thistle can be difficult to find, especially since it often grows amongst Wild Wormwood - Artemisia campestris, a common dune plant that looks nearly identical in its rosette form. Pitcher's Thistle is most easily spotted while flowering, from late June to early August. The peak of flowering for the Port Crescent colony was around July 4th. The flowers are large and pinkish-cream colored, setting it apart from other thistles which are mostly purple. The plant is said to flower only once and die, although, I think I have seen the same plant flower twice. Most plants produce only a few flower heads, 1 to 10, but sometimes 20 or more. Pitcher's Thistle was probably quite rare even before European settlement, but apparently stable enough to thrive for centuries. Low genetic diversity and low seed germination has apparently restricted the species from its earliest time along the Great Lakes. The plants require just the right sand coverage for germination and growth. Its restricted life cycle allows minimal chances for seed production, which are prone to intense animal consumption, and make it very sensitive to abnormal weather. It is restricted to a shoreline habitat that is increasingly developed and intensively used. Invasive weeds like Spotted Knapweed - Centaurea maculosa have displaced it in some dune areas. For anyone along the Thumb shoreline with a little vegetated beach left, especially Huron and Tuscola Counties, keep your eyes open. It's possible that a few Pitcher's Thistle remain somewhere.